The study, which is based on responses from more than 31,000 original owners of 2009 model-year vehicles after three years of ownership, measures problems experienced during the previous 12 months by those original owners. Overall dependability is determined by the level of problems experienced per 100 vehicles (PP100), with a lower score reflecting higher quality. According to the study, the dependability of 3-year-old vehicles has improved by 19 PP100 from the 2011 dependability study, and averages 132 PP100 in 2012. This improvement is similar to the industry trend noted in the J.D. Power and Associates 2009 Initial Quality StudySM (IQS). Further, vehicle reliability as measured in the VDS has improved at an average annual rate of 8% from 2009. In fact, overall long-term vehicle dependability is the strongest it has ever been, and the gap between initial quality and long-term dependability continues to close. "Overall long-term vehicle dependability is the strongest it has ever been, and the gap between initial quality and long-term dependability continues to close." Despite facing immense challenges in 2009, automakers placed a keen focus on delivering outstanding levels of quality, which they understood would be essential to their long-term success, said David Sargent, vice president of global automotive at J.D. Power and Associates. Three years later, owners of these models are enjoying unprecedented levels of vehicle dependability and manufacturers are experiencing market recovery. This is good news both for owners who are holding onto their vehicles for longer than ever and manufacturers, since perception of quality and dependability is a critical factor in vehicle purchase decisions. However, according to Sargent, there are several brands that have performed very well in dependability during the past several years but still face challenges with customer perceptions of their reliability. In particular, during the past four years, models from Buick, Cadillac, Ford, Hyundai and Lincoln have achieved consistently strong levels of dependability, but still have relatively high proportions of new-vehicle buyers expressing reliability concerns. Building vehicles with high levels of dependability is obviously a necessary element in reshaping consumer perceptions, said Sargent. Negative quality perceptions are notoriously difficult to change, and it takes considerable time, but effectively communicating improvements in dependability may reduce concerns, and by extension, help new-vehicle sales. In addition to reporting problems experienced with their vehicle, owners who participate in the VDS also indicate whether components were replaced, as well as the specific components replaced. Among brands, Cadillac has the lowest component replacement rate in 2012, a decrease of 3.0 percentage points from 2011, as well as the third-lowest overall PP100 (104 PP100). Also, Dodge has the largest year-over-year decrease in component replacement rate (a 9.4-percentage-point improvement). While Dodge continues to have one of the highest PP100 scores (183 PP100), the brand has improved by 23 PP100 from 2011. Forty-two percent of vehicle owners who did not experience any problems say they definitely will purchase the same make next time. Repurchase intent steadily decreases as long-term quality worsens. Fully 25 of 32 brands have improved in dependability from 2011, while only six have declined and one has remained stable. Domestic nameplates have improved in 2012 at a slightly faster rate than imports, narrowing the dependability gap to 13 PP100 from 18 PP100 in 2011. Lexus acheives the lowest PP100 rate in vehicle dependability among all nameplates in 2012. In addition, the Lexus LS has the fewest problems in the industry, with just 72 PP100. Porsche improves by 16 PP100 and has the second-lowest PP100 rate. Cadillac and Toyota also improve by double digits. Lexus, Porsche, and Cadillac were also the top three nameplates in the 2009 IQS. Scion and Hyundai achieve their highest-ever rank positions in the study, fifth and ninth place, respectively. Toyota Motor Corporation garners eight segment awards more than any other automaker in 2012 for the Lexus ES 350 (in a tie with the Lincoln MKZ); Lexus RX 350; Scion tC; Scion xB; Toyota Prius; Toyota Sienna; Toyota Tundra; and Toyota Yaris. The Toyota Prius has ranked highest in the Compact Car segment for 5 consecutive years. Ford Motor Company receives three model awards for the Ford Explorer (in a tie with the Nissan Murano); Ford Fusion; and Lincoln MKZ (in a tie). General Motors (Buick Lucerne and Chevrolet Equinox) and Nissan Motor Co., Ltd. (Nissan Frontier and Nissan Murano, in a tie with the Ford Explorer) each receive two awards. In addition, the Hyundai Genesis also receives an award. Consumer perceptions of vehicle quality and dependability are often based on historical experiences or anecdotes and may be out of line with the current reality. Consumers should gather as much information as they can on the latest models from a variety of sources to make an informed decision. Vehicle dependability is at an all-time high and resale values are also very high by historical standards. If your vehicle has been properly maintained and is in good working condition, it may be worth more than you think if you are considering trading it in. The Vehicle Dependability Study is used extensively by vehicle manufacturers worldwide to help design and build better vehicles, which typically translates to higher resale values and higher customer loyalty. It also helps consumers make more-informed choices for both new- and used-vehicle purchases. 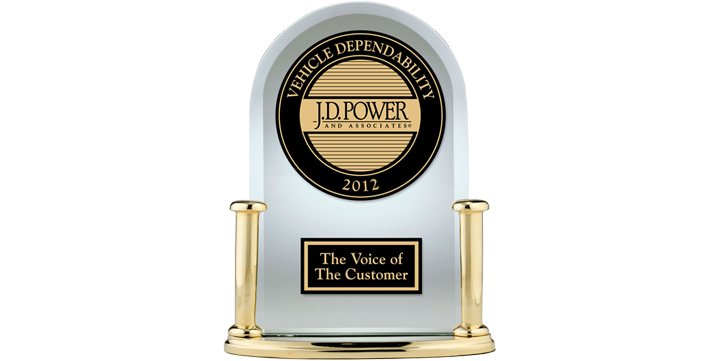 The 2012 Vehicle Dependability Study was fielded between October and December 2011.